The bodybuilding benefits of Whey protein make it the most popular supplement taken by bodybuilders. Muscles need protein to grow and recover from workouts. 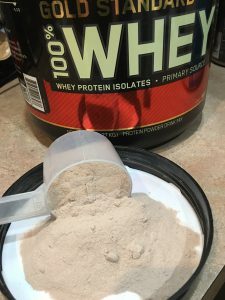 The biggest benefit of whey protein powder is that it is convenient (just put a scoop in a glass of water of milk and stir), fast absorbing, potent, and most brands are absolutely delicious! Take 25-50 grams (1-2 scoops) of whey first thing in the morning and another right after working out. That is 75-150 grams per day of whey protein. You should have a protein shake before bed, but I recommend Casein Protein or a blend of whey and casein. This is because casein takes longer to digest so it will “feed” your muscles all night as your body rebuilds. See article Casein vs Whey Protein. Bodybuilders need 1-1.5 grams of high quality protein per pound of body weight each day. That is 200-300 grams for a 200 lb bodybuilder. It is very difficult to consume that much protein in regular solid foods like chicken, beef and fish. One scoop of most whey formulas gives you 22-25 grams, so if you drink 2-3 shakes a day, you benefit by getting 50-75 grams quickly and easily. The rest you should get from whole foods regular meals. Something I have recently discovered are pancakes made with whey protein isolate! These are really good! You can check out Protein Pancakes for Bodybuilding. See Wikipedia article on Whey Protein. There are no documented negative side effects to supplementing with whey protein. However, people who are allergic to dairy products, or are on a dairy restricted diet for medical reasons, should not use it without consulting a physician. Click here for more information about Lactose Free Protein Powders. If you suddenly increase the amount of protein you are eating on a daily basis, you may notice a slight increase in intestinal gas, which is normal, regardless of what type of protein you are using. What is the best whey protein for bodybuilding? This question can be answered in several different ways. Best quality, best taste, and best price. ON (Optimum Nutrition) Whey Protein Gold Standard, in my opinion, is the best overall protein, and many must agree as it is the best selling protein product for the past 5 years. The best tasting is of course, impossible to answer as everyone has different tastes, but I have tried many different brands and flavors. My personal favorite is BSN Syntha-6 Chocolate Milkshake or Mochaccino. Whey is one of the two types of protein found in cow’s milk. Milk is approximately 87% water and 13% milk solids. The milk solids are comprised of fat, lactose, protein and a small amount of other minerals. The protein portion of the milk solids is approximately 80% casein and 20% whey. Whey is much more quickly digested by the human body than casein and it has a higher biological value, which makes it the most nutritious protein available. Ion exchange is one of the manufacturing methods. When the casein or curd and milk fat are separated from milk in order to make cheese, the remaining liquid whey goes through a series of filters to separate the whey protein from lactose and other ingredients. This concentrated liquid whey then enters an ion exchange vessel, which then uses electrical charges to purify the whey protein. The purified product is then dried to remove moisture. Ion exchange is another method that is used to make higher quality whey protein supplements. Sweet dairy whey is combined with a special resin in large vessels. These vessels are then charged with electricity and the resin bonds to selected proteins. The resin proteins are then taken from the vessels, the electric charge is reversed, and only the whey protein is left. Ion exchange results in a powder that has a very high percentage of protein. ​This is also a popular method for making whey protein. This process involves taking sweet dairy whey, which is a product from cheese manufacturing, and passing it through a series of ceramic filters. As it is passed through the filters, fat and lactose are removed, which leaves a concentrated liquid form. This liquid is then dried and instantized for easy mixing. One of the benefits of producing it this way is that there is no high heat used, which helps prevent damage to the protein. Who can benefit from supplementing with whey protein? ​Anyone involved in sports activities, especially bodybuilding, will benefit greatly from supplementing properly with whey protein. In addition to supplying the body with all the essential and nonessential amino acids, whey protein is especially rich in naturally occurring branched chain amino acids (leucine, isoleucine, and valine). These particular amino acids are used directly by skeletal muscles, and therefore are in great demand during exercise or strenuous sports activities. How much does Whey Protein cost? ​The cost of whey protein can vary greatly depending on the manufacturer, the process used to create the whey protein, additional nutrients that may be added, etc. ​Where can I get Whey Protein Powder? ​Whey protein supplements can be purchased at any health food store, but the very best prices are available through the links on this page. ​What flavors does it come in? Whey protein is available from many different manufacturers. In any number of different flavors. The most popular flavors are of course vanilla, chocolate and strawberry. Who has the cheapest whey protein? ​I would recommend staying away from the cheapest you can find. I would recommend Optimum Nutrition’s Gold Standard because it is a very high quality product that is not too expensive. There are many other quality manufacturers, including BSN, EAS, Ultimate Nutrition, Designer Whey, MuscleTech and many others. ​How do I make a whey protein shake? Follow the label directions on your particular supplement for a guideline, but you can mix it with milk (preferred), water or juice. One common method is to use a 12 ounces of milk in a blender with one or two scoops of whey protein. You can also add fresh strawberries, bananas, ice cream, peanut butter, crushed ice, or anything else that suits your fancy. Use a blender for best results. You can mix it with a spoon, but it will take a while to make it smooth. ​Can I mix other supplements with it? Will whey protein help me build muscle? If I am taking whey protein, do I need to eat protein from other sources? ​When is the best time of day to take whey protein? ​Since it is quickly digested by the body, the best time of day for a bodybuilder to take whey protein is in the morning, and immediately after a workout. Taking it in the morning is beneficial, because you have gone several hours without any protein, and you want to get it into your body as quickly as possible. Taking it immediately following a workout is beneficial because this is the time when your body craves protein more than any other time. The quicker you can get high-quality protein into your depleted muscles, the better. ​Do all bodybuilders supplement with whey protein? ​Most, if not all bodybuilders supplement with some kind of protein powder. Whey protein is by far the most popular choice due to its low relative costs, high biological value, and BCAA content. ​What are some of the additional health benefits of whey protein? Whey protein has many health benefits in addition to supporting muscular growth. It has been shown to assist the immune system by raising glutathione levels. Glutathione is an essential antioxidant that protects cells and neutralizes toxins such as carcinogens and heavy metals, among others. Studies in animals have shown that we protein concentrate, consistently raises glutathione levels further than any other kind of proteins studied, including soy. (Bounous G. and Gold P., Clin. Invest. Med. 1991). Along with its ability to enhance the immune system, whey protein fights infections. Research animals given whey protein showed increased response from hormonal and cellular immune systems to salmonella and Streptococcus pneumonia. This response was not seen with other types of protein (Bounous G., Konshavn P., Clin. Invest. Med 1988). In addition to whey proteins ability to assist the immune system and fight infection, is its apparent ability to fight cancer. In vitro research has shown that exposing breast cancer cells to low concentrations of whey protein causes the growth of the cells to be inhibited (Baruchel S. and Vaiu G., Anti Cancer Research 1996). Another clinical study showed regression in some cancerous tumors when subjects were administered 30 g per day of whey protein powder (Kennedy R.S., Konok G.P., Bounous G., Baruchel S. Lee T.D., Anti Cancer Research. 1995). Additional research was done to confirm this study in which rats were given whey protein, and also subjected to DMH. The result again was fewer tumors and a smaller pooled area of tumors. The researcher’s conclusion was that we protein, offered “considerable protection to the host,” when compared to other proteins, including soy (McIntosh G. H., et al. Journal of Nutrition 1995).